Add: 628C Ha Noi Highway, An Phu Ward, Dist 2, HCM city. The Vista, one of the largest development in the prime residential area, Thao Dien - An Phu, in District 2 of Ho Chi Minh City, is a complex of premium residential condominiums, shopping mall, serviced apartments and offices.With over 23,000-square meters land area, The Vista has all it takes to be a first-class mix-used development. The five residential blocks provide the market with 750 residential condominium units while Commercial Tower of the development comprises of 100 serviced apartment units and over 4,200 sqm of office space. Additionally, Vista Walk, the Retail Area, is spanned over the first three levels of The Vista's Tower 1, 2 and 6, is offering a hub of essential services indluding childcare service, clinic facilities, retail & F&B outlets and mini-market. Delight in an oasis of absolute serenity, The Vista is away from the bustle of the city with lush flora set to perfection a series of beautiful fountains and water features. Thoughtful features and tasteful fittings of all the units offering a luxurious lifestyle. From timber flooring for bed rooms, quality air-conditioning, modern kitchens, lavishly-fitted bathrooms to the stylist built-in wardrobes. 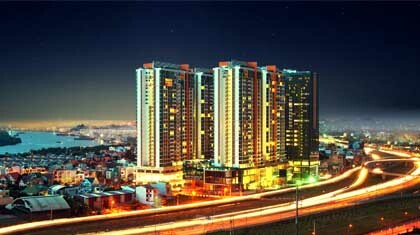 Located in one of the most desirable residential area of Ho Chi Minh City, The Vista is surrounded by the area blends intimately with an expatriate community and affluent locals making its location a difference with a unique combination of quality residential, government, and entertainment and retail-related commercial areas. Thao Dien - An Phu is a hub of international standard amenities such as many International Schools, diversified F&B community, Art and Entertainment Facilities as well as shopping destination such as the Metro Hypermarket. The Vista yet enjoy the close proximity to the commercial and administration centre of District 2 and some other major residential condominiums in Thao Dien - An Phu. The upcoming Vista Walk Mall and Vista Commercial Tower are at the doorstep of The Vista Condominium are where the new commercial, retail and office space and Serviced Apartment are spicing up the whole development. The upcoming Metro line 1 which will be opened in 2015 is within the walking distance from the Vista's entrance. Enjoy the exclusive condominium style, The Vista has a complete full range of lifestyle and fitness facilities at your door step. Enjoy a refreshing swim in an over - 50-metre lap pool that overlooks beautifully landscaped gardens, or relax in the state-of-the-art clubhouse with spa, steam and sauna.